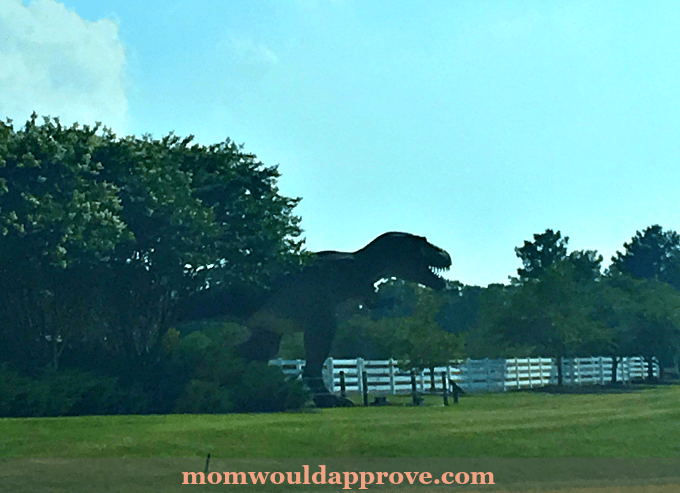 Most families looking for a family vacation come to Virginia for the oceanfront beach located in Virginia Beach, but what other things and places are there to do and see? There are so many things to do at the beach, but when you live here, you just want to find other things to do. The best way to solve that is to leave Virginia Beach and think a little farther North. We will go past Williamsburg and head towards Richmond, but not that far. 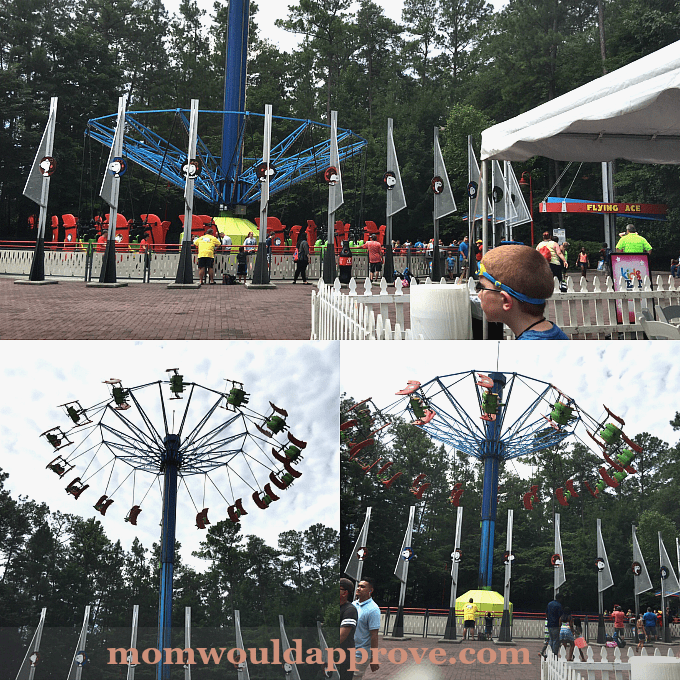 We’re headed to Doswell, where there’s this Amusement Park and Water Park all-in-one called Kings Dominion. Now this is where we want to be! 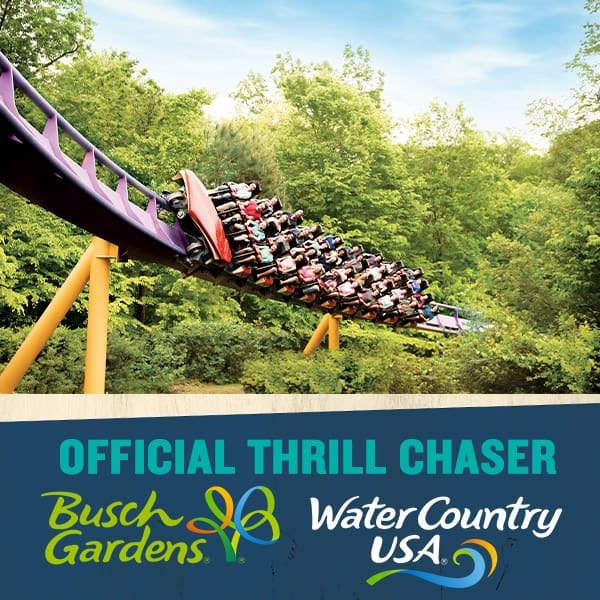 Once you get into the park, you’ll notice that it’s a nice and flat surface, no big hills to walk up, the only time you have to walk up, is when you’re going to ride a ride like a roller coaster. Something that requires to be off the ground. As you walk through the entrance, these are in the middle, they break up two different sides. One side will take you to some roller coasters and the other side will take you to some water rides; like White Water Canyon (this ride is where up to 6 people sit in a big raft and they go around the stream, someone will get soaked by the waterfall, I know, because I got soaked, this is also my favorite ride, I couldn’t leave until I rode it) and Shenandoah Lumber Company (this is the ride where up to 3 people sit one behind the other and go down the tall waterfall, this was my sister’s favorite ride) and a couple other ones. 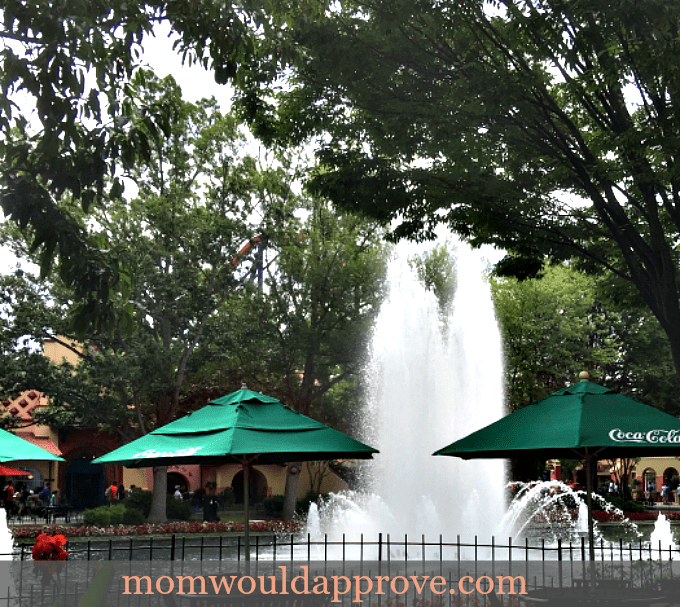 We were there for the kids during KidsFest so we decided to check out Planet Snoopy first! 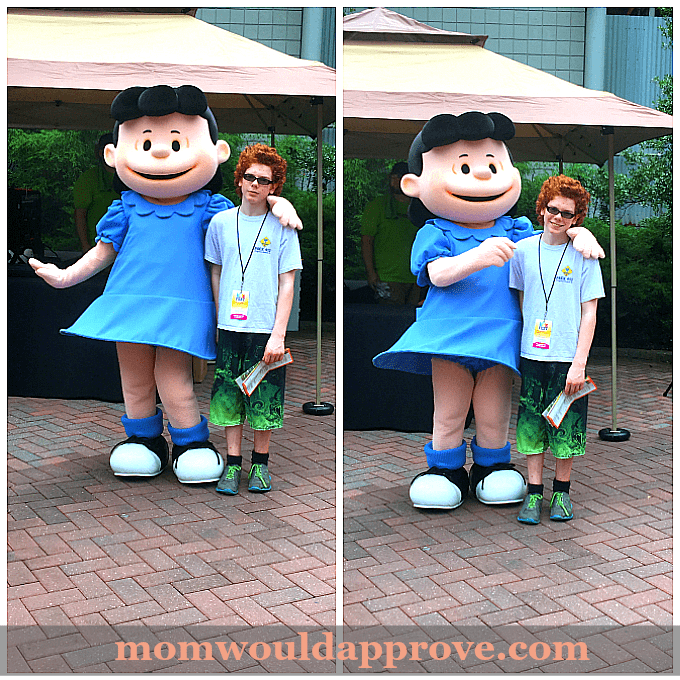 The characters from Charlie Brown were walking around, so of course we had to get some pictures taken. He looks so thrilled huh, lol. The second pic, Lucy poked his cheek and got him to smile, you can see the result there. This was the first ride (Flying Ace) we came to in Planet Snoopy, no one else wanted to ride it, so my husband said he’d go. As we walked around the park some more, we found a pretty waterfall on one of the trails. 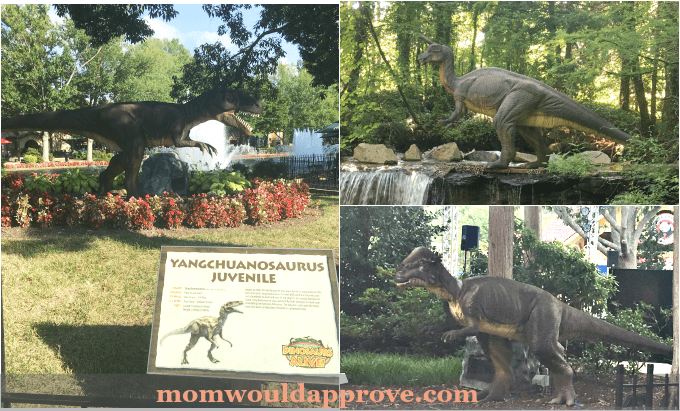 They have a Dinosaurs Alive exhibit with more than 40 life-sized dinosaurs, the admission isn’t apart of the park ticket (unless you get a summer pass), but the tickets are really cheap. 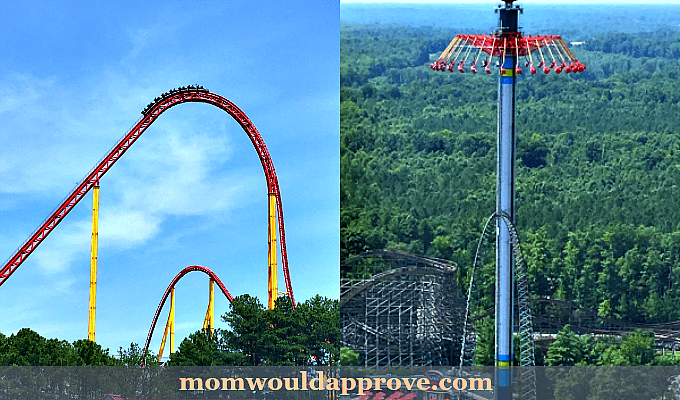 These are two of the fast rides they have, which my oldest and husband are the only ones to go on those type. 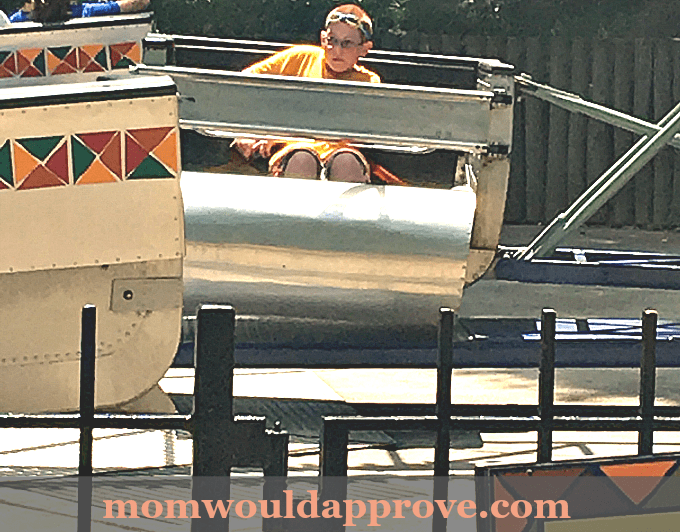 My youngest and I would never step foot on a roller coaster or a ride that goes up in the air. The closest ride we came to for that was their version of the Eiffel Tower, which just took you up to look over the whole park. 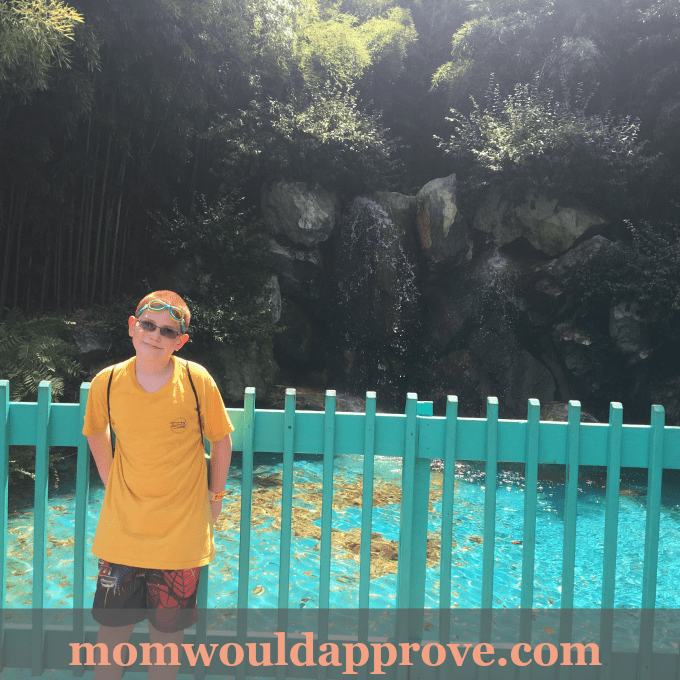 My youngest Austin’s favorite ride was The Scrambler, he rode it about 4-5 times while we were waiting for my husband, his brother, and aunt to get off the Volcano (roller coaster) ride. This ride you go fast in and out of the circle. This is what you see while leaving. It started to storm and we had to hurry up and leave out of there, plus they were shutting everything down when it started to rain and then thunder and lightning. If you have any questions please don’t hesitant to ask, and if you like this post, please share it and/or subscribe! 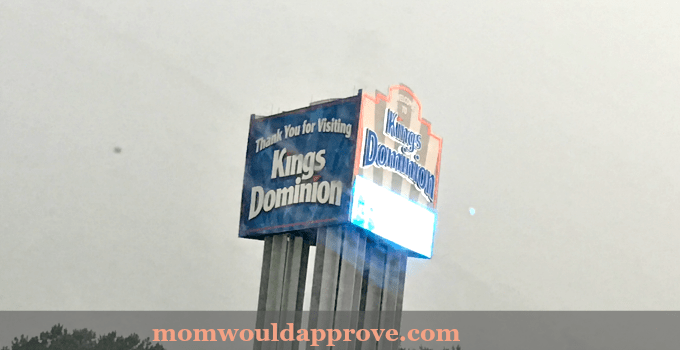 Kings Dominion looks just right for either a day trip or a nice weekend getaway from Virginia Beach. It was very fun, Alison, plus it’s always nice to get away from the normal. Also with all the tourists here for the summer, the beach can get pretty crowded.